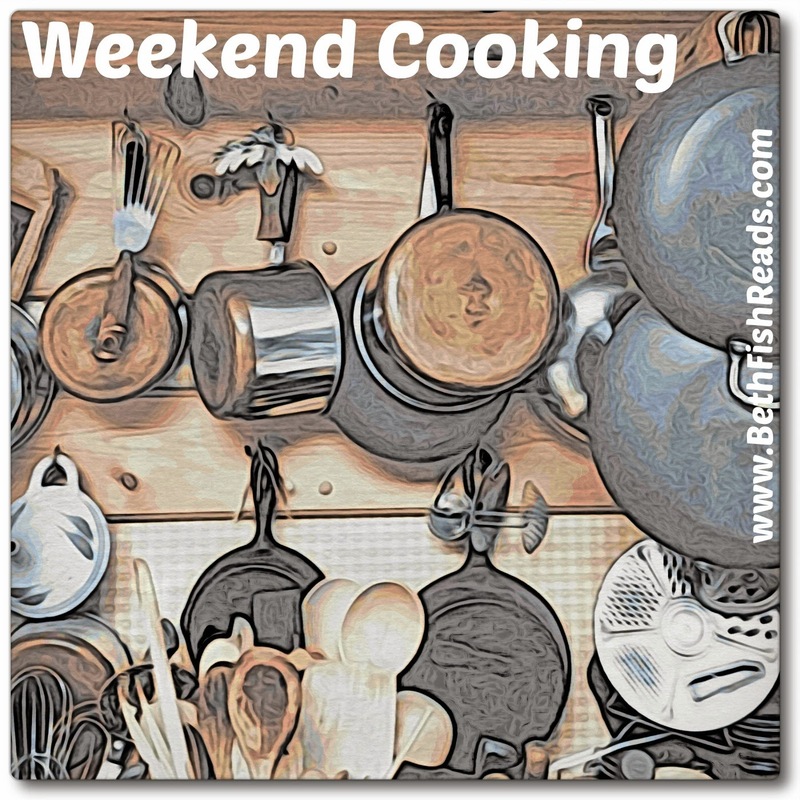 It has been a very long while since I last participated in Weekend Cooking, hosted by BethFishReads, but I have never stopped reading the series. In fact, a regular part of my Saturday routine includes reviewing the various linked posts while sipping my morning cup of coffee. Since retiring last May, I have thought more about cooking. Mind you, that thought has not yet translated into action, but I am mentally preparing myself to spend more time in the kitchen. I enjoy cooking, but the hectic life of my thirties and forties, combined with children’s finicky palates, led to a lifestyle of frozen conveniences and fast food. My body is now craving more healthy food options. I am not looking to diet in order to lose weight, although I think it is possible with this system. Rather, I am looking to adopt a healthy way of life – one that includes lots of variety, full of flavor, and adheres to my motto of “moderation in everything”. 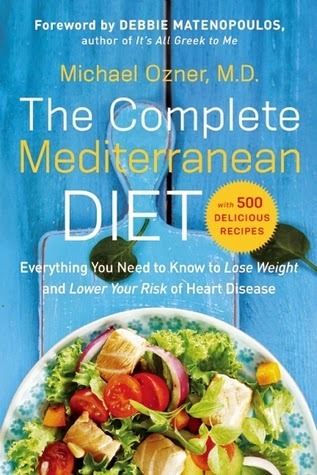 When I heard about the Mediterranean Diet, I knew I had to check it out. My husband is 100% Italian, and I love all things French. We are already entrenched in the Mediterranean mindset. Over the past few years, I have slowly tried to shift from a meat-and-potatoes dinner fare to more chicken, fish, and vegetables. What I really need is not necessarily a system, but a jumpstart to creating weekly menus that foster creativity rather than boredom. I must confess that I have not thoroughly researched this topic. I found the book at my local library and checked it out. I enjoyed reading the benefits of this kind of diet, and I think I have discovered a few tips to help me incorporate this way of eating in my own life. Color is key. Rich, brown whole-grains are better than colorless white. A variety of vegetables on a plate is better than a large chunk of protein. Food that is pleasing to the eye is also pleasing to the tummy. Olive Oil is a good fat. Not only are there health benefits to adding this ingredient to my “fat free” diet, it also adds flavor to an otherwise bland menu. I am so excited to have an excuse to visit The Tasteful Olive and Penzeys on a regular basis. Almonds and/or Walnuts should be a part of a daily snack regimen. Again, moderation is key (no more than 10-20) … but these flavorful nuts are filling and add a delightful crunch to the day. Fruit for dessert. I struggle with eating enough fruits and vegetables, especially in the winter when I seem to crave stick-the-ribs comfort food. But in reading through the sample menus, a simple fruit dessert is a great way to add the sweet at the end of the meal without adding empty calories. Reduce sugar. I have always assumed this meant reduce “sweet”, but as I learned above, it is not the sweet flavor that needs to be eliminated from a healthy diet. Honey and pure maple syrup can also be used (in moderation) to bring out natural sugars. I will say, however, I am not an advocate of using artificial sweeteners, as the author suggests. Moderate exercise. I do believe it is easier to walk everywhere when you live in the small, picturesque villages of Tuscany or the large cosmopolitan cities of Paris or Rome. Living in the suburbs of Kansas City requires a car. However, I can be purposeful in my daily life to get up and MOVE. I used a fitbit this summer to track 10,000 steps a day, and I think it is time to do that again. Restful Sleep. The author highlighted the Mediterranean habit of taking a daily nap after the noon meal (which by the way, tends to be the largest meal of the day). I’m not sure that will become a part of my routine here in the states, but I do try to get seven hours sleep a night. An herbal afternoon tea, however, is a custom that I can easily adopt. While there are several other components to this lifestyle, these are the highlights that I will focus on first. 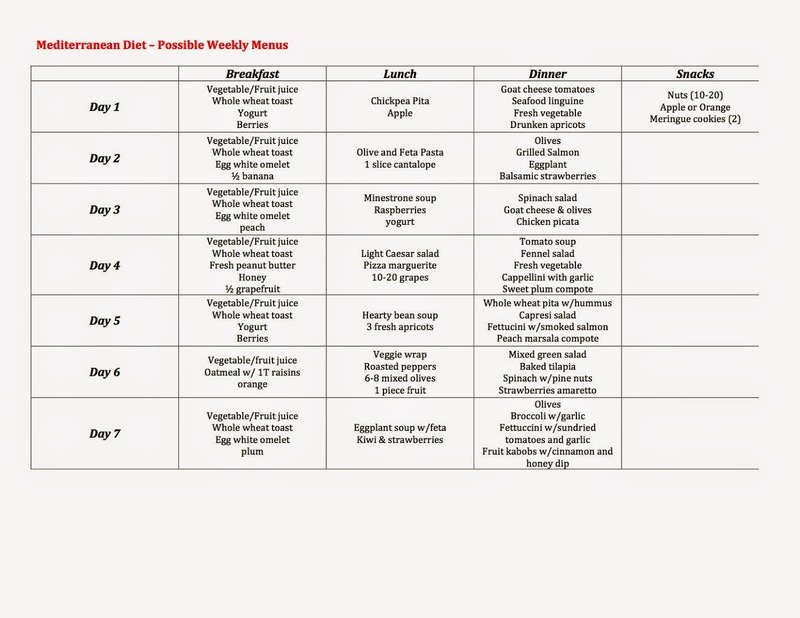 I thoroughly enjoyed reading the sample 14-day menu, which I copied into a word document for easy access. I think once I adjust to the system, finding my own recipes will become a natural way of life. I am hoping to observe the people in France and Italy on my upcoming trip – what they eat and how they live life – so when I return home, I can fully adopt this diet and this lifestyle. I like the sound of that 7-day menu. Yummy stuff. I'm not a napper, but I do try to add more walking — even in little ways (parking a little farther back in the parking lot, for example). We eat fruit for dessert and for snacks. Try making a fruit salad every week with what looks good at the store or farmers' market; having it already made up in the refrig makes it easy to turn to fruit for dessert or a snack. We're starting to plan a trip to Rome in October 2015! Very excited, as it will be our first big trip in many years. I'm looking forward to walking the city and eating the Mediterranean diet while we're there! Carl's doctor has recommended this to help him lower his cholesterol so I really do need to check it out. Thanks for sharing some great tips and your thoughts about this book. Lucky you going to France and Italy! It's a meal plan that works for me. And when I came back from Greece and Italy one of the first things I noticed was our American impulse to get as close to the store as possible, rather than walking any distance at all. There, it's all about the walk after dinner. ThTs a great meal plan, Molly. I am completely on board! The Mediterranean lifestyle and recipes have always appelEd me me. We love the good olive oil we get from an olive oil store. I've spoiled us, though. My husband complains about salad dressings in restaurants because they aren't as good as the ones I whip up on the fly from great ingredients. Great idea to watch how Europeans eat!